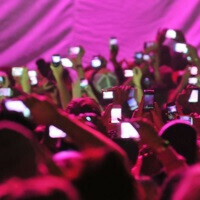 Smartphones may be a part of our daily lives, but an unfortunate side effect is their distracting presence at shows and concerts. Many artists have been adding strict bans on bringing smartphones and tablets to the usual restrictions of cameras and other recording equipment. Electronic group Booka Shades decided to do the opposite. The three musicians partnered up with Vodafone and Makelight Interactive to create a mobile experience for their live show. Makelight provided an app to concert goers which syncs their phones to the music and turns their glowing displays into an elaborate light and sound show. To successfully tie smartphones into the show, though, Makelight had to make them 10 times louder using speaker accessories. Unfortunately or not, your average smartphone still isn't loud enough to compete with a club sound system, no matter how it's advertised. Check out the short film that Bouka and Makelight produced together to fill the parts which cannot by expressed by mere words. F**k yeaa!! !now that's a concert i would like join!!! I was hoping for more of a visual effect, but still interesting, and we might see some really cool stuff in the next few years, if this takes off.